What can art tell us about the mysteries of underwater life? Robertina Šebjanič explores the fascinating world of jellyfish, shrimps, fish and sea urchins. Robertina Šebjanič is an artist and researcher fascinated by underwater life. Her work explores the relationship between humans and animals, often through an unusual medium: sound. Šebjanič collaborates with other artists, philosophers, and marine researchers to explore the unexplored and complex world of underwater inhabitants, taking her audience closer to nature and encouraging us to reflect on our influence and relationship with other forms of life. Armed with a hydrophone, Šebjanič has sailed across the Atlantic Ocean and the Aegean, Adriatic, and North Sea, recording a myriad of sounds coming from different species living underwater. The resulting soundscape compositions are beautiful immersive pieces that reveal there’s much more going on underwater than most of us tend to think. But Šebjanič’s work also highlights how much sound pollution from humans there is in today’s aquatic ecosystems. “The more I recorded and listened to the material, the more I realized that these sounds are today’s sonic reality of the ocean and that there are not many places that are free of man-produced sounds,” the artist said in an interview. Life underwater relies on sounds as much as terrestrial species to communicate, and their habitats can be severely affected by the ubiquitous use of ships, sonars, and sound cannons for oil exploration. Researchers studying this phenomenon have linked it with the beaching of whales and the Lombard effect, by which certain species become louder to overcome background noise, ultimately increasing the volume of the whole habitat. You can listen to the audio compositions here. 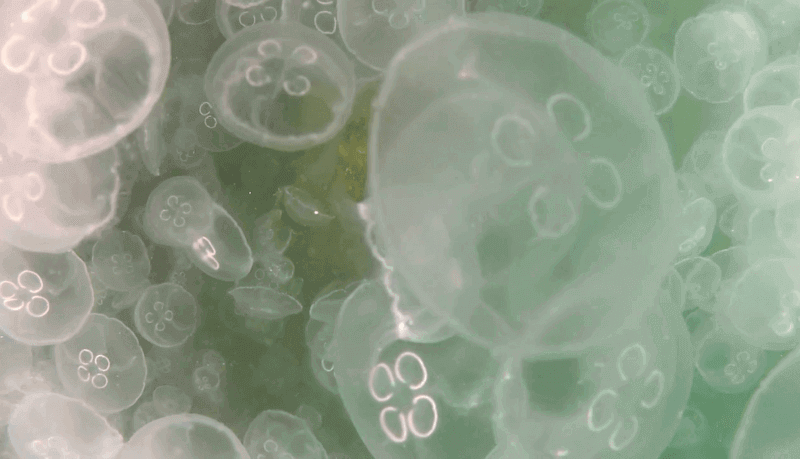 The collaborating performers Robertina Šebjanič chose for this project are moon jellyfish. As the animals go about their business in an aquarium, a camera captures data of movement, contraction and interaction, which is then processed and used to navigate sound archives, coming mostly from underwater recordings of jellyfish bloom the artist did herself in Izmir, Turkey. The result is an audiovisual display in which the jellyfish and the artist perform together. Jellyfish have existed for over 500 million years, adapting and surviving many changes in their habitat. Some species are known to be immortal. Not even human activity seems to disturb them, as it is happening with corals or fish. Šebjanič writes on her website that this could make this animal “one of the rare organisms that seem perfectly suited for the Anthropocene era,” able to survive the next mass extinction.